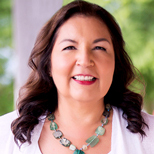 Anita Sanchez, Ph.D., Aztec and Mexican-American, is a transformational leadership consultant, speaker, coach and author of the new book The Four Sacred Gifts: Indigenous Wisdom for Modern Times (Simon & Schuster). She bridges indigenous teachings with the latest science to inspire and equip women and men to enjoy meaningful, empowered lives and careers. For more information, visit www.FourSacredGifts.com.